Shortly thereafter, Joshua discovered that Gibeon was located near the center of the land, and despite their deceit, the treaty, which was considered sacred, was honored. (Josh. 9:16–27.) The Gibeonite covenant of tribute to the Israelites lasted for hundreds of years. 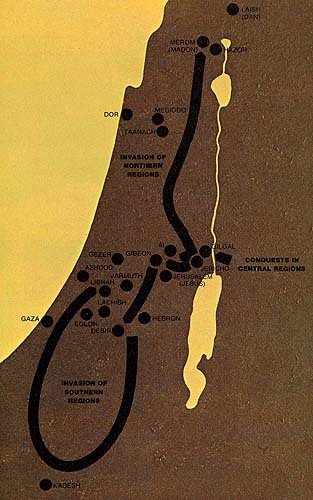 The reports of Israel’s success in the southern portion of Canaan served as a warning to the city kings of the north. These northern rulers, allied under the direction of the king of Hazor, met the Israelites in battle in the heart of their own territory at the waters of Merom. The Canaanites were defeated and many of their cities destroyed. (Josh. 11:1–14.) This major conflict did not secure all of the land for Israel, but it did provide a basis for the settlement of the people. Joshua takes captive the five kings hiding in a cave at Makkedah.